Look forward to a tranquil getaway in the wooded hills of East Edmond at this quiet vacation rental! This 1,800-square-foot home sits on a 10-acre property a little more than 20 miles from downtown Oklahoma City. Featuring 4 bedrooms and 2 baths, round up your family of 10 to experience all this charming home offers! 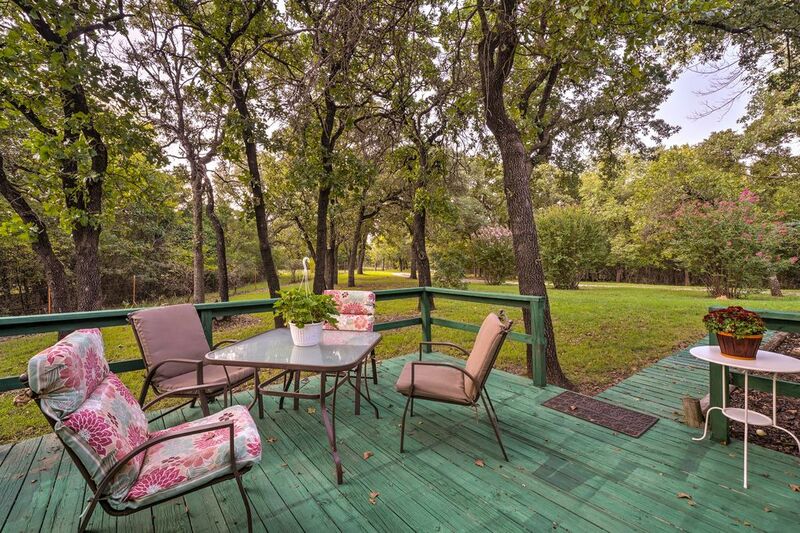 You'll love lounging on the deck while surrounded by towering trees. Leave your stress behind as you enjoy the peaceful relaxation at this quiet house in Central Oklahoma! Whether you're lounging in the tastefully decorated, welcoming interior or soaking up some fresh air on the deck, you're guaranteed to be more than content during your stay. Kick back and relax in the spacious living room on the comfy sofas. Flip through shows with Roku before you find something you like to watch on the flat-screen cable TV! The space features lovely nature-themed decor and a traditional decorative fireplace set on a brick hearth. The whole gang can work to prepare delicious homemade meals together in the expansive kitchen, furnished with white cabinetry and fully equipped with all the appliances you need for a convenient cooking experience. Sit down at the elegant wood dining table to enjoy your feast! The deck is an ideal spot for drinking coffee in the morning as the sun rises or at night with a glass of wine as you socialize with the group. Take in the simplicity and beauty of the nature surrounding you and keep an eye out for wildlife! When the night concludes, rest your heads in the cozy king beds, queen beds, and sleeper sofa. You'll love the peacefulness that comes hand-in-hand with this vacation rental home's private location, but don't worry - you're still in convenient proximity to a handful of popular destinations! The new Edmond, Hilton Convention Center lies just 4 miles away, while both the University of Central Oklahoma and Oklahoma Christian University campuses are just a little bit further into town. If golf is your game, you'll want to tour the beautiful Oak Tree National golf course, host of the 1988 PGA Championship. When you're seeking some outdoor thrills, drive 15 minutes to Spring Creek Park and Arcadia Lake, hike or bike around the trails, and enjoy some unforgettable waterfront recreation. With a connection to I35 just 3 miles west, you can reach all the hot spots in OKC in 30 minutes. You'll have a blast in OKC watching college football, exploring museums like the Oklahoma City Museum of Art or the National Cowboy & Western Heritage Museum, and walking around the famous Bricktown Entertainment District. Make sure to pay respects and visit the Oklahoma City Bombing Memorial. Take a quick 5-minute drive to see the Arcadia Round Barn, a landmark on the historic Route 66 that's worth a few photos! Check out the rotating events at the Lazy E Arena, 15 minutes from the property. Dine in style at the only Michelin 3-star restaurant in Oklahoma - Fait Maison Restaurant - only 9 miles away! This property is a beautiful 10 acres of quiet with a house that simply says "Welcome" when you enter. The listing description was exactly what we found when we arrived. The house is so comfortable and the space was more than we expected. There were nine (9) adults and we had more than enough room. We were in the area for a Life Celebration for my mother and it took less that 20 minutes to get to the venue in Edmond. For a property that appears to be away from restaurants and activities our travel time to every place we went was less that 30 minutes. I would highly recommend this property to my friends and relatives. We will use it again when family comes from out of town. Thank you to the owners for their gracious hospitality. This is a very private setting in the trees with no neighbors in site. We would stay there again. The home was clean and well supplied. Had a wonderful stay over 3 days. Just a delightful property that is quaint and quiet and beautifully decorated. Super well organized and Very clean. Loved all the warm little touches that made us feel so welcome. Truly a home away from home! We will definitely choose to seat again next time we are in the area. We stayed the weekend here when we were in the area for my daughter’s swim meet. The property was peaceful & quiet & the home was extremely well kept. The owners thought of everything, all the comforts of home. The home is fully stocked with anything that you could possibly need & the owner reached out prior to our stay asking if there was anything in particular we needed or would like to have at the home. The beds were comfy & it was so nice that everyone had their own space. So much better than if we had stayed at a hotel. I would absolutely recommend this property to anyone & we will definitely stay here if we are ever in the area again. A great getaway in a country setting. This home is an absolute country gem. The owners have gone to the extreme to provide everything needed to feel as if you are right at home. Our visit to the area was business related, and after a rigorous day it was a relief to return to the house, prepare the evening meal in a well equipped kitchen, and then relax and get a good night of sleep. Thank you Karla for your wonderful hospitality. Home is well kept in a quiet part of town. We had two adults present with our 5 children and yellow lab. The weather was cold but the kids and dog couldn't help but explore the nice 10 acre property. Very clean and good communication by the owners. Will stay again if they'll have us.